In 305 BC, Demetrius I of Macedon laid siege to the city of Rhodes for an entire year. In spite of his title as "Besieger of Cities" he failed to conquer the Rhodians. To celebrate their victory, the Rhodians sold his siege equipment and used the funds to erect a triumphal statue to their great god, Helios. The work was assigned to Chares of Lindos who worked on it for twelve years (292 BC to 280 BC). Despite the fact the Colossus was considered one of the seven wonders of the ancient world, both a technical and artistic masterpiece, there is a lack of vital information concerning the site it occupied and its actual shape. It is calculated to have been about 31 meters high. It is said that Chares cast the, bronze limbs of the statue very slowly, on the spot, within enormous mounds of earth, moving from the bottom upward, just as one would build a house. 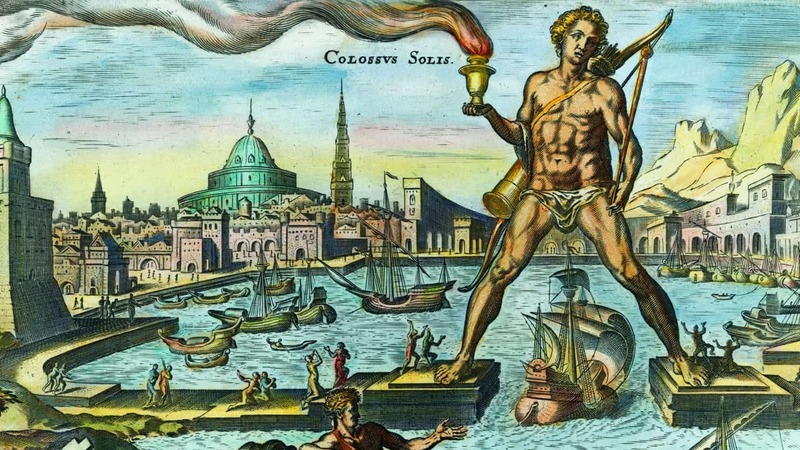 According to one account, the Colossus stood across the entrance to the harbor allowing ships to pass between its open legs. To day it is almost certain it stood on dry land and that the most likely site was the enclosure of the temple of Helios, near the palace of the Grand Masters. But this "wonder" stood for no more than 54 years. During a severe earthquake in 226 BC it cracked at the knees and fell. The Rhodians, fearing a curse, did not reerect it and it lay there in a heap for many centuries. ' But in 653 A. D. when the Arabs of Moab pillaged Rhodes, they sold the pieces to a Jewish merchant. Tradition says that it took 900 camels to transport it. But the legend surrounding it was so closely tied to Rhodes, that for many centuries both Greeks and Westerners called the Rhodian people "Colossians". 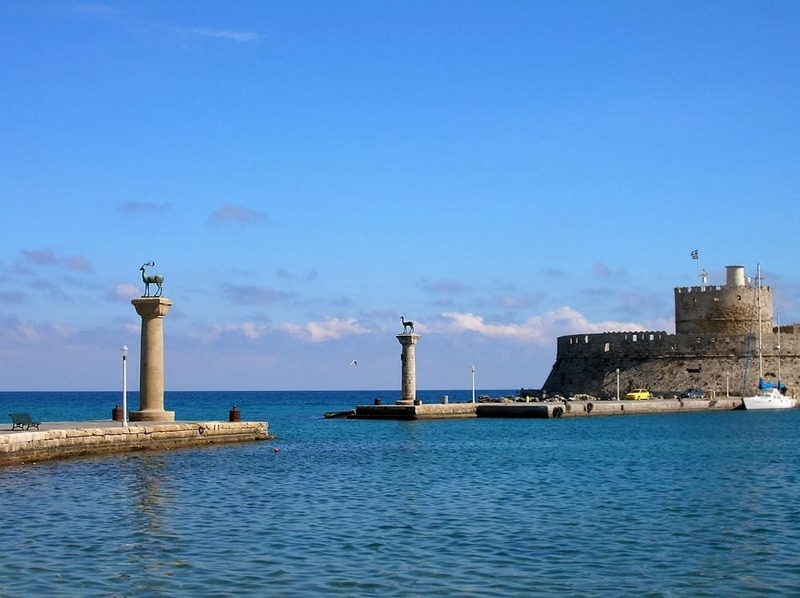 Media reports in 1989 initially suggested that large stones found on the seabed off the coast of Rhodes might have been the remains of the Colossus; however this theory was later shown to be without foundation. There has been much debate as to whether to rebuild the Colossus. Those in favour say it would boost tourism in Rhodes greatly, but those against construction say it would cost too large an amount (over 100 million euro). This idea has been revived many times since it was first proposed in 1970 but, due to lack of funding, work has not yet started. 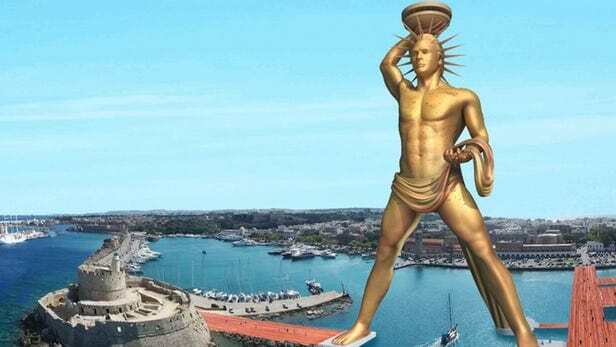 Finally, everyone on the island of Rhodes have agreed to rebuild the statue of Colossus one of the seven wonders of the ancient world is to be rebuild the experts said. The only major issue is how to program such a project and who the investors will be. There has been a discussion, whether the municipality of Rhodes city will offer the capital Itself or all islands municipalities together or the Greek government. Although such a project since if projects the history of Rhodes, and at the same time the history of the Europe it could be financed by the European Union completely. Another issue is to build this statue in a way that if would look like the original one for sure no one knew how it looked like. Another question; where the statue is to be placed ? The Archaeologists have different opinions about it's location in the past. The experts say that it would be better for this statue to be built in front of the port and at a distance from it so that it can be seeing from any direction. The fact that "Liberation" the French newspaper supports the aspect that Colossus should be rebuilt shows that the entire European public opinion can initiate all the efforts at the same direction. During the "1st Rhodes international travel forum", Colossus was one of the head subjects that were discussed. The conclusion coming up after all is that this project known as one of the destroyed seven wonders will rise up the European heritage on civilization.